Cubic Boron Nitride Products – cBNMesh and cBNMic Cubic Boron nitride, cBN, is the second hardest material after diamond but it has one key advantage over diamond: it does not chemically wear in the presence of graphite and/or carbide forming elements like iron, nickel or cobalt, for example, during abrasive processing. 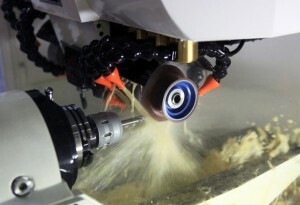 It is therefore the preferred product for machining of ferrous materials. 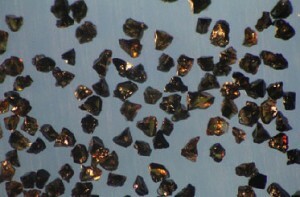 Unlike diamond, cBN is only available as a synthesized material, it does not occur naturally. But this means that, like synthetic diamond, it can be tailored to provide exactly the required characteristics for the application and key to this is the ability to synthesize tetrahedral morphology in addition to the cubic / octahedral morphology that also occurs in diamond. It is available from coarse grit down to micron powder and as sintered polycrystalline products. 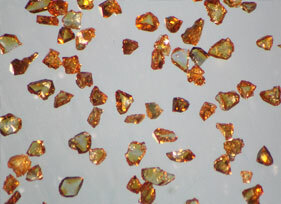 cBN varies in colour from a light amber colour to a boron rich black colour and this difference does manifest itself in a difference in performance depending on the tool type and application. For instance, the boron-rich material is often considered more difficult to use in electroplated tools since it can lead to overplating. NDP markets its range of cBN under the trade names cBNMesh and cBNMic. cBNMesh is available from 50/60 to 325/400 mesh and cBNMic is available from 0-0.5 micron up to 40-60 micron. There is a variant suitable for all of the bond types commonly used: metal, electroplated, resin and vitreous. It is available with a 60% nickel cladding for resin bonds or titanium for metal bonds. As a grit product, cBNMesh it is used in grinding wheels for a myriad of applications: high stock removal OD and surface grinding, profile grinding, surface finishing and sharpening of steel cutters. As a micron product, cBNMic is used for lapping, honing and polishing of many components in fields of automotive, aerospace and scientific instruments.